Pond5, the world’s stock media marketplace, is sponsoring online radio show and podcast, the daily Digital Production BuZZ broadcasts from the NAB Show again this year, announced Larry Jordan, the show’s executive producer. Combining Pond5’s products with the world-wide reach of the Digital Production Buzz is a great combination. Pond5, the world’s stock media marketplace, is sponsoring the Digital Production BuZZ’s daily special report coverage of the NAB Show 2011 to be held in Las Vegas, April 9-14, 2011 announced Larry Jordan, the show’s executive producer. "Pond5 stands apart from other companies offering stock media. The quality and breadth of their images and audio content, combined with their dynamic marketplace, make them a very exciting company to watch," said Jordan. "Combining Pond5’s products with the world-wide reach of the Digital Production Buzz is a great combination." This year the BuZZ will create seven one-hour Special Reports, direct from the NAB trade show floor, booth SL#12114 -- highlighting all the news from across all the halls and dozens of interviews with industry leaders, hosted by Larry Jordan and posted at http://www.NABShowBuZZ.com every evening (Las Vegas time), starting Monday, April 11th. Pond5, the World's Stock Media Marketplace™, is a community-driven marketplace for media makers. It features the web’s largest collection of royalty-free stock footage (over 500,000 video clips), as well as millions of stock photos, vector illustrations, music tracks, sound effects, and After Effects motion graphics templates. All media on Pond5 is instantly downloadable, and licensed under a simple royalty-free license. Prices, which are set by contributors, range from $1 and up. Pond5 was launched in 2006 and is based in New York City. To learn more about Pond5, visit http://www.pond5.com, or become a fan on Facebook at: http://www.facebook.com/pond5. Visit Pond5 at NAB Show 2011 in two convenient locations, booth SU2009 and booth SL7413. The NAB Show will take place April 9-14, 2011 in Las Vegas (exhibits open April 11). It is the world's largest electronic media show covering filmed entertainment and the development, management and delivery of content across all mediums. 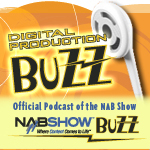 The NAB Show BuZZ, powered by the Digital Production BuZZ is an official podcast of the NAB Show 2011. The National Association of Broadcasters is the premiere advocacy association for America's broadcasters. NAB advances radio and television interests in legislative, regulatory and public affairs. Through advocacy, education and innovation, NAB enables broadcasters to best serve their communities, strengthen their businesses and seize new opportunities in the digital age. New episodes of the weekly Digital Production BuZZ air live every Thursday from 6:00 to 7:00 pm PST. Listen live at the show’s website or download the program later on iTunes. The BuZZ also offers a Newsletter that gives listeners a behind the scenes view of each week’s show, available at http://www.digitalproductionbuzz.com. Digital Production BuZZ can be found at booth SL12114. Larry Jordan & Associates, Inc. provides high-quality, engaging training and information covering video production and post-production for practicing professionals and students through a variety of media worldwide. The company was founded by Larry Jordan, an internationally-renowned digital media analyst, producer, director, consultant and Apple-Certified trainer. 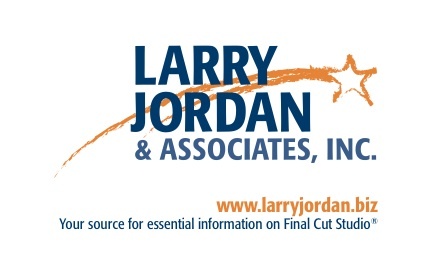 Jordan’s FREE Monthly Final Cut Studio Newsletter is read by Final Cut users around the world available at http://www.larryjordan.biz/nxlttrs.html.